The proven design of the EPIC 2500 x 2.0mm Hydraulic Pan Brake provides accurate bends and folds in automatic or manual mode. The careful construction means this machine is made to last. Optional features can deliver a true 2-axis pan brake. 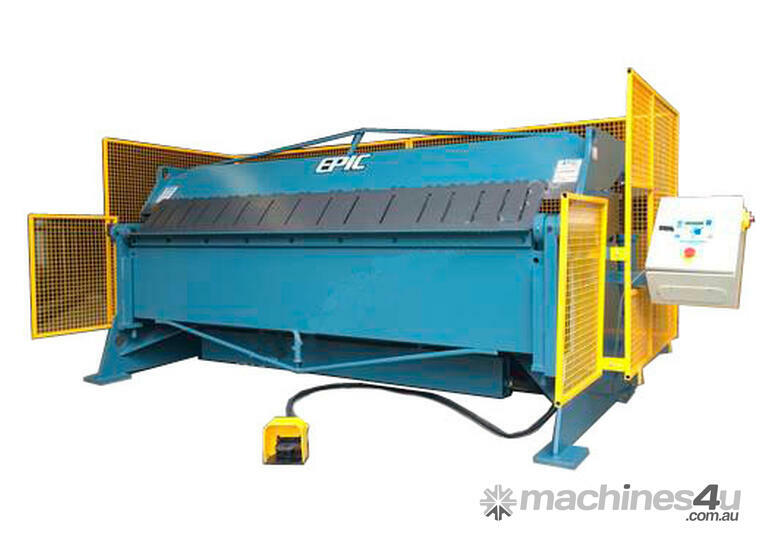 The EPIC Hydraulic Pan Brake is designed and manufactured in the company's NSW workshop. 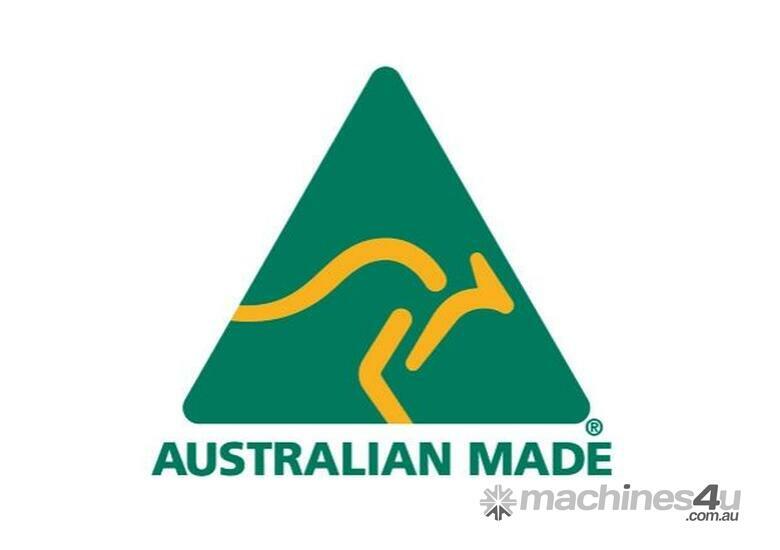 EPIC has been manufacturing sheet metal processing equipment for more than 40 years, and the company’s high quality Australian-made machines are built for precision and reliability – and are made to last. EPIC has technical services Australia-wide. 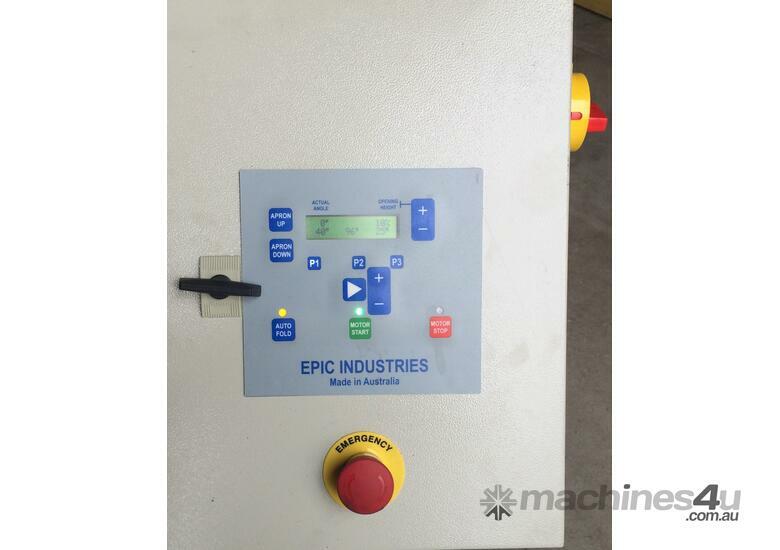 Plus, EPIC offers personal customisation and modification of all machines. EPIC can apply Australian-approved guarding systems to any of its existing pan brake models. Laser guarding can be integrated into the existing electrical and mechanical systems without impacting work efficiency, machine speed, job accuracy or ease of control. All the standard features are included with or without the guarding. 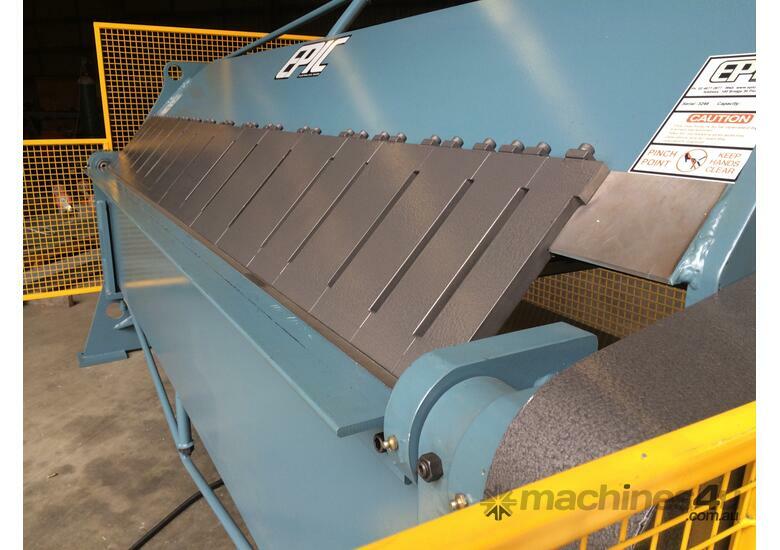 This particular machine is an EPIC 2500mm x 2.0mm Hydraulic Pan Brake with AS4024 Laser guarding to Category 3. EPIC's hydraulic ram mounting system is designed for minimal deflection under recommended loads. The full tonnage delivered by the clamping rams is transferred to the head through the trunnion bearings. 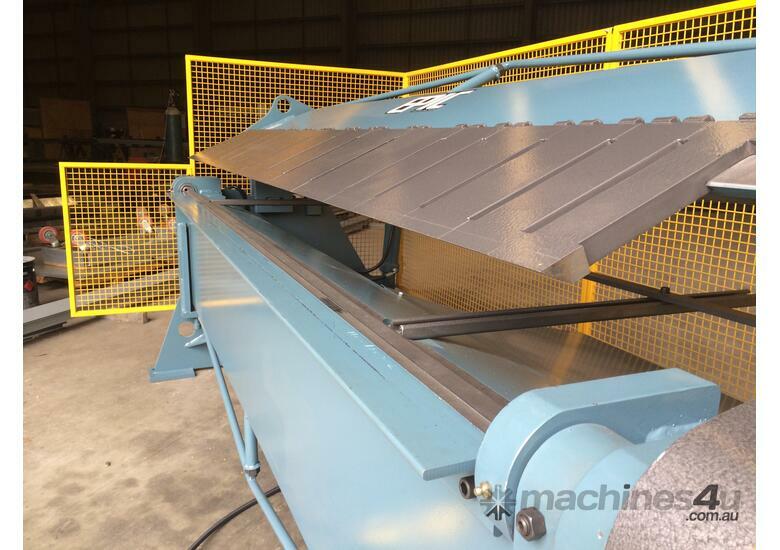 The bearings are mounted to the side frames of the machine providing support even at the centre of the machine head and minimising any side movement. When bending at full capacity this achieves a smaller radius and a nice straight bend/fold. The pan brake can be operated in automatic or manual mode. In the auto cycle, the operator sets the angle, clamps the material, and then triggers the switch to automatically raise the apron to the designated angle. Once the fold is made the apron will lower automatically and the head will unclamp. In the manual mode, the clamp is operated via a foot switch. The material is clamped and the bend is made; the angle of the apron (bending beam) is displayed on the controller screen. The apron can be raised or lowered at any time via the foot switch, enabling the operator to set the angle required for the fold. The desired angle can be saved in the controller so that the fold can be easily replicated. Manual settings on the controller can be overridden, allowing the operator to complete a fold without changing or losing a setting. This is useful when production has to be interrupted for a rush job. 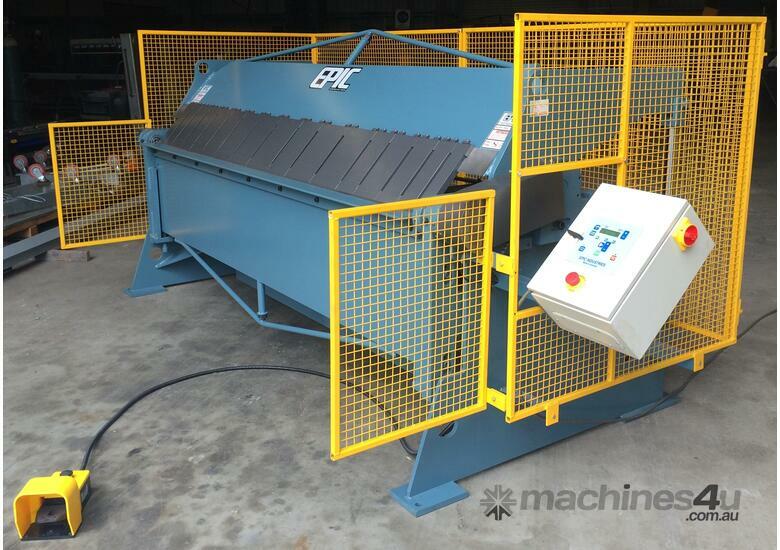 Contact EPIC today for more information on all our customisable sheet metal fabrication equipment.